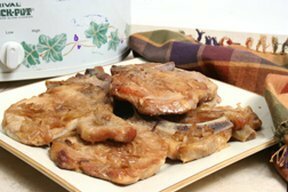 The meat will be so tender that it will fall off the bones when you try this slow cooker recipe for cooking pork chops. Chops can be hard to cook without them becoming dry but with this slow cooker recipe you will never have dried out pork chops again. See how to rotisserie cook a chicken for a moist flavorful meat with a nicely browned, crispy skin. Use our step-by-step guide to learn how to prepare different types of moist and tasty meat by using a slow cooker.